Location: 15 acres on Reed's Creek and adjacent land between N.C. Highway 21 and Lake Norman, just North of Exit 33 on I-77, and immediately South of the new Cypress Landing Town Homes. Goal: To improve water quality, and aquatic and wildlife habitat on the site. Situation: Funds for mitigation project provided by N.C. Ecosystem Enhancement Program, which seeks to offset damage to streams and wetlands during private development or state road construction with other restoration projects. 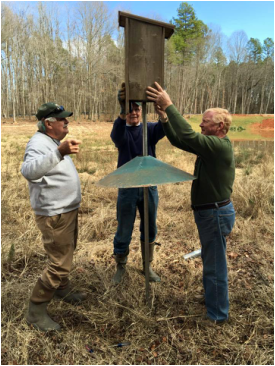 The Reed's Creek Project is designed to mitigate for wetlands damage elsewhere in the Catawba River Basin. Project Contractor: Mid-Atlantic Mitigation of Concord, NC. Removal of creek side berm to allow flooding of project site (done). Installations of test/monitoring devices (done). Monitoring of project site until 1012. Removal of litter and tires from creek and site (done). LNWC site analysis for placement of bird nesting boxes. Manufacturing and installation of nesting boxes, etc. Patrolling of site by LNWC for litter pickup and general inspection. Work to have wire fence erected on both side of Hwy 21 over Reed's Creek to prevent litter and tires from entering creek. Effort by LNWC to engage adjacent property owners in enhancement of project area. This is an ongoing project and if you are interested in helping or need more information contact Eric Peterson at peteysr@aol.com or 704-660-3508.